Weeks later, ignoring the unpacked boxes, I stop making excuses and set out with my camera. 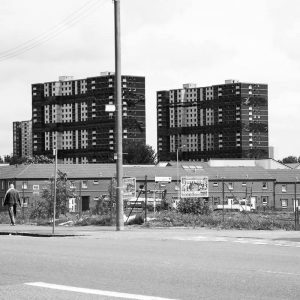 As a born southsider I’m on familiar terrain but I’m soon reminded that this is Glasgow and nothing lasts for long. In fact Google Earth can’t keep up. Journey south from the city centre, over the Clyde, along Eglinton Street and at first you barely register the changes. Most people pass through this corner on their way to somewhere else and only very few travel on foot. Things look pretty much as they have for the last few decades: the gap site between Kilbirnie Street and St Andrew’s Cross still lies vacant but not, I suspect, for much longer. 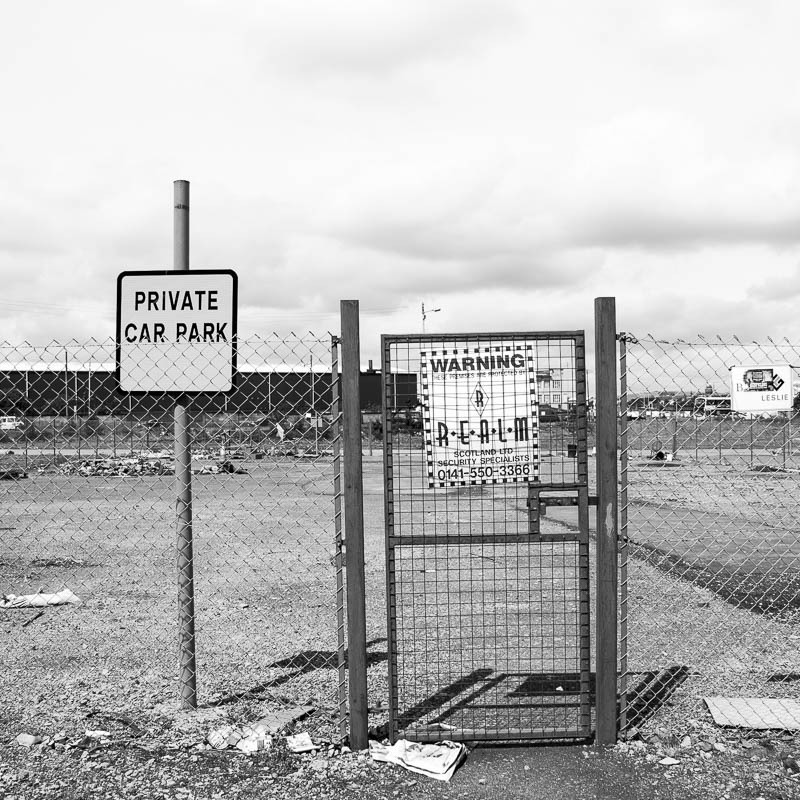 This is confirmed by the absence of billboards and the sudden appearance of security firm signs attached to a chain-link fence around the site perimeter. In the near distance stand the condemned Stirlingfauld high-rises in Laurieston, currently packed with explosives and due for demolition next month. Prowling the rim of this land I note an enterprising sign – ‘private car park’ where a section of ground has been fenced off but there’s not a car in sight. Beside it, also fenced off, two guys, one in a boilersuit, squat on the rubble with a open black suitcase and several bottles, as if conducting a school experiment. When I ask they tell me they’re testing the water for contaminants. In turn I enquire about the fate of this slice of long-abandoned land. They’re hesitant. One of them mentions the proposed M74 corridor, but he’s not sure. 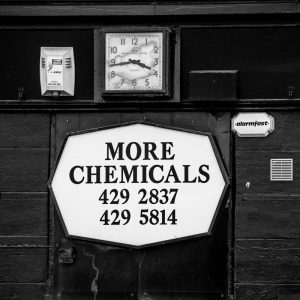 I head west, pausing to snap the clock at the corner of Turiff Street and the intriguing More Chemicals sign. 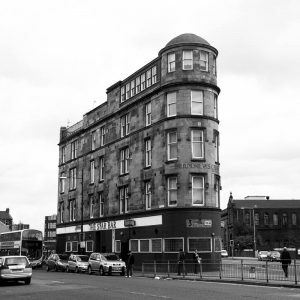 At St Andrew’s Cross on Victoria Road – Glasgow’s answer to the Flatiron Building – a new housing development on the site of the old Plaza Ballroom is nearing completion, named after the legendary dancehall and even retaining part of the original red sandstone façade. Opposite the Star Bar (three course lunch £2.50) I find another of those metal boxes bearing the legend Glasgow Corporation Electricity Department. A little further down Pollokshaws Road I reach Utopia, yet another development on the site of the old DHSS office where I recall, shortly after graduating from Art School, being advised by a female member of PER (Professional and Executive Recruitment) to consider cleaning as a career move. I may well have missed my calling – a flyer through my door tells me a cleaner costs £10 an hour. 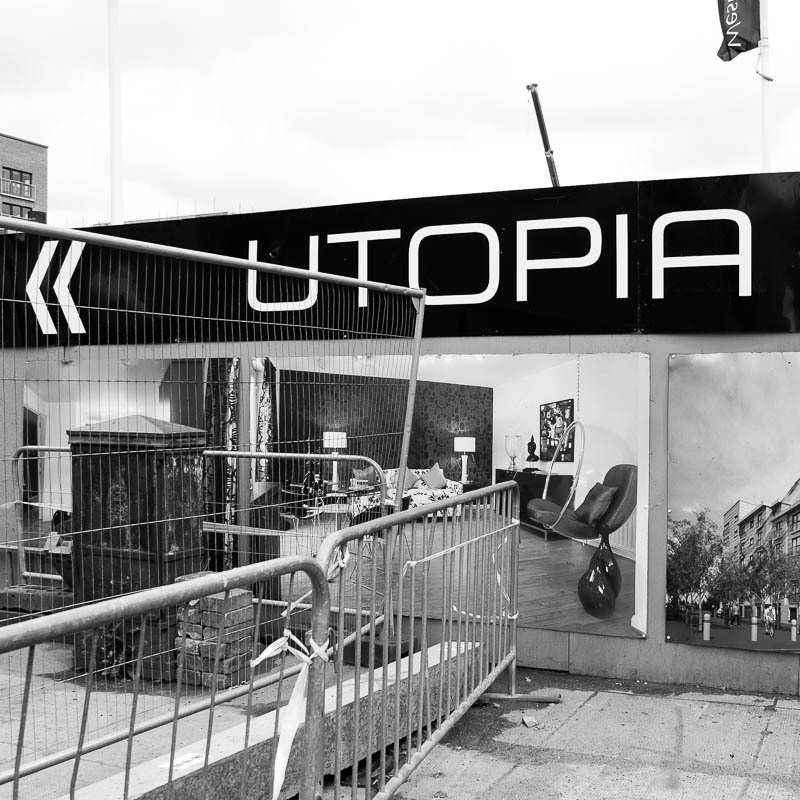 Utopia is a set of luxury apartments but today the promotional hype rings even more hollow in a housing market less depressed than suicidal. 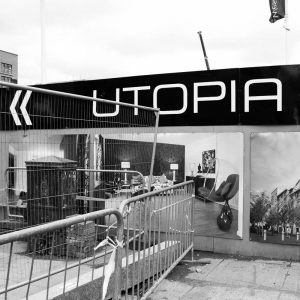 Utopia also announces itself as an enclave of Southgate. Southgate? Never heard of it. And it occurs to me – how many of these new developments have sprung up from nowhere in recent years and who’s in charge of naming them? The name Southgate, vaguely suggestive of an ancient portal, is neutral to the point of negligible, a nowhere and everywhere place. It’s a subject worthy of further investigation, given the number of signposts dotted around the city pointing the way to newly reminted places. Heading west, I arrive at Queen’s Park, designed by Sir Joseph Paxton and opened to the public in 1857. Named not after Victoria but Mary, Queen of Scots, it’s a splendid example of urban green space – well maintained and not conspicuously given over to commercial ventures – yet. There’s Goals, a set of five-a-side football pits, with a parking charge of £2 for those not using the facility. Elsewhere there are numerous free recreational areas: the football pitch co-opted by local Scottish-Asian lads playing cricket, as well as tennis courts, pitch and putt and several children’s play areas. There’s also a celebrated Victorian Glasshouse and two ponds. The park is also home to an abandoned bandstand and two long-established private bowling clubs. 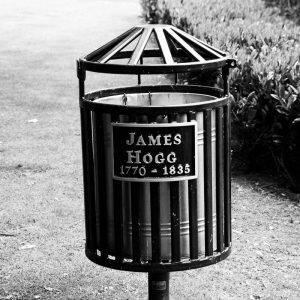 I have to plead ignorance of several of these names and can only presume I’m not alone, though in a Victorian public park it seems appropriate, albeit in a culturally improving top-down kind of way, to present a simple set of names and dates with no explanation. There’s no visible corporate sponsorship slapped on to remind the viewer of the largesse bestowed by the patron just as there’s no attempt to corral us into passive, unquestioning appreciation. But I’m confounded by the James Hogg commemorative litter bin. What, I wonder, was the motive behind this creation? And what would the author of The Private Memoirs and Confessions of a Justified Sinner make of it? An ironic statement on the nature of writing or a misjudged afterthought on the part of the city council parks department? I check the contents. No discarded manuscripts to be found here, only a banana peel and a few damp fag ends. 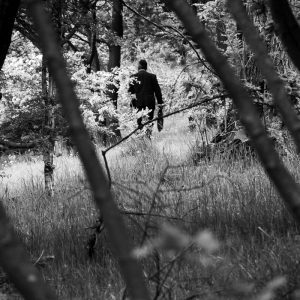 Clambering up the mysteriously-named Hill 60, a scrubby, semi-wooded area ring-fenced for the conservation of wildlife, I spot the incongruous figure of a man in a smart suit. I stop in my tracks, camera poised. I see he’s carrying a bag of some sort and striding purposefully in a north-westerly direction. I imagine the possible scenarios, inventing motives for him being there on a dull May Friday afternoon. 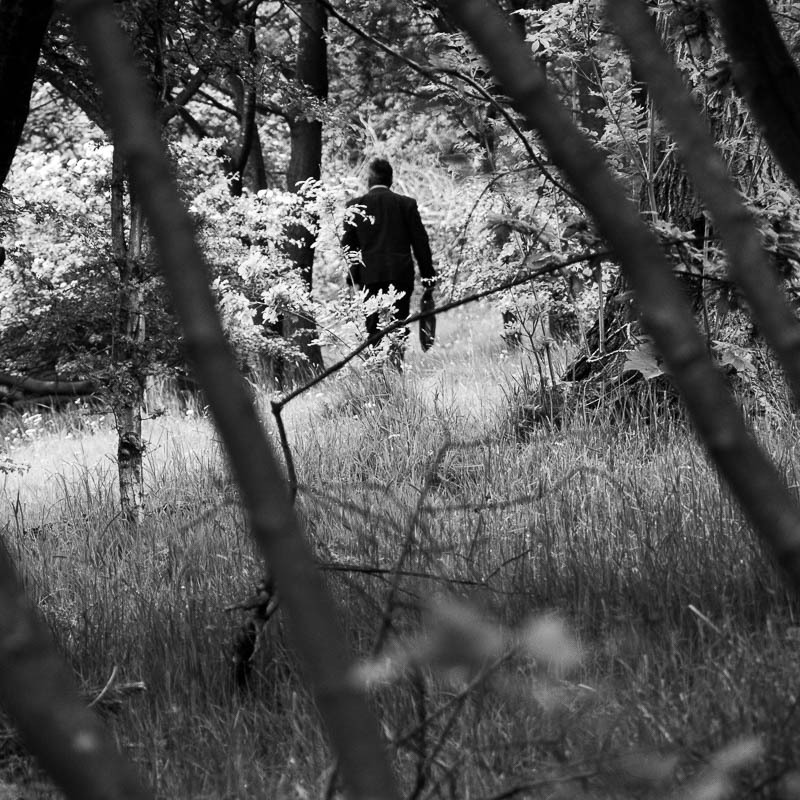 But moments after I snap him on a long lens he vanishes into the shrubbery. 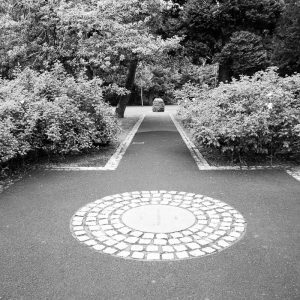 Like him, I have my own purpose for being here: to relocate the Camphill Earthwork and to discover whether it’s altered since my last visit – when? Ten years ago? Longer? Turns out the place is not so hard to find. What’s harder to find is the truth. The site is said to date from the pre Iron-Age and when Harry Bell visited the area in the early-mid 1980s, he described trampling through a field of knee-high rye-grass. No more, as I discover when I find the loose circle of stones, set in neatly clipped grass, situated at the highest point of the park. Some accounts say that the earthwork, radiating over an area of 100 metres, was the site of a Celtic fort, some mention the site was used as an encampment for troops during the Battle of Langside, while others claim there’s nothing ancient about them, that the stones were the result of excavations during the construction of the M8 motorway and dumped here in the 1970s. 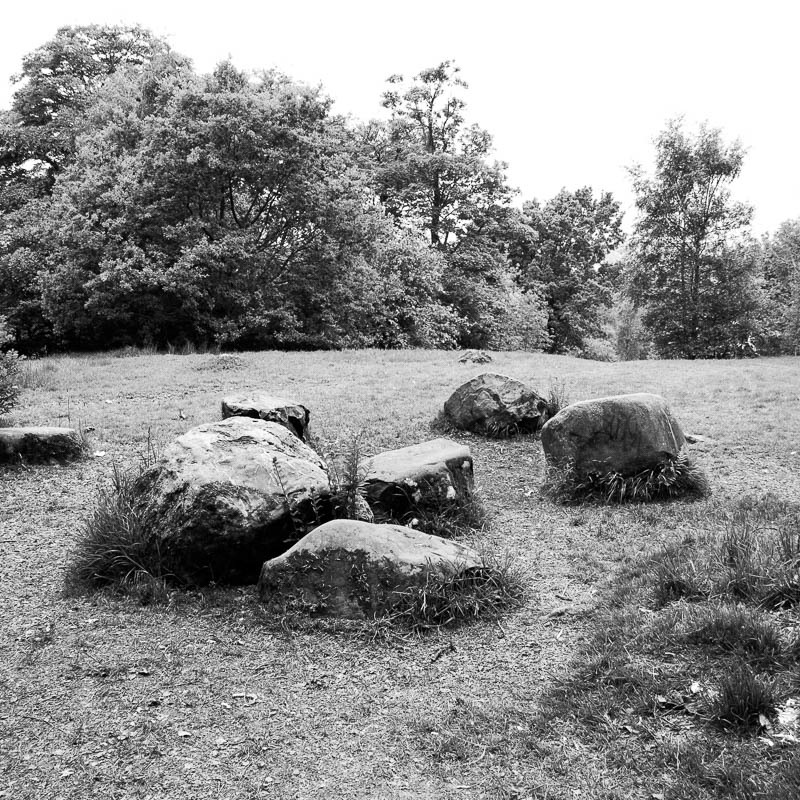 Either way, what I’m looking at is a set of large boulders, some with recent, rough carvings – eg. Michael G – some tagged in pale blue marker pen. Is there magic here? Circling the site on this damp, overcast day, looking for clues, I can’t say for certain if there’s a resonance here or not, but I detect a sense of slight foreboding. Suddenly I’m startled by a dog dashing out from behind a bush, followed by its owner. Maybe I’m still thinking about the mystery man in the suit. That, or I’m just feeling the chill.